Total weight gain/measurements: My belly is 39 inches! That's another half inch since last week. 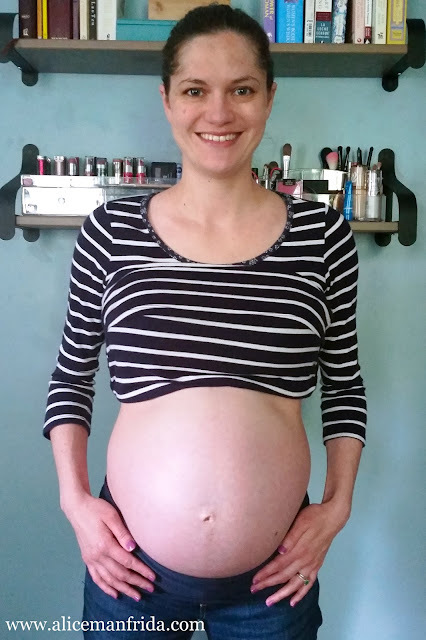 Maternity clothes: I finally decided that I needed to go up a size for underwear. 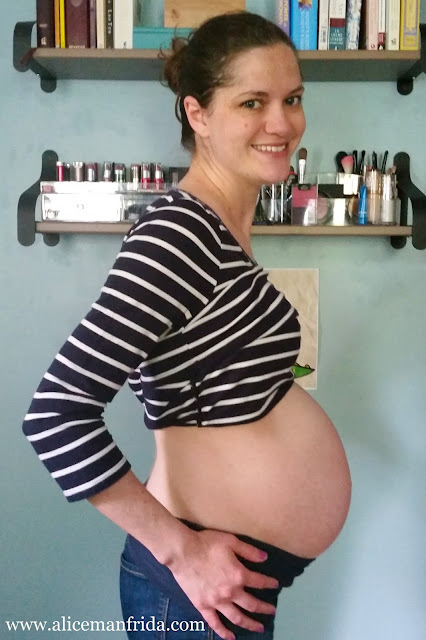 I'm kind of wearing both sizes during the day but I can't wear my pre-pregnancy size for sleeping at night. It's digging in too much now. I also ordered a pregnancy support band/belt...I'll post a picture when it gets delivered so you can see what I'm talking about. My friend has one and I'm jealous so I immediately went online and ordered one for me. Ha ha! Sleep: I think the longest stretch I can get is 6 hours at a time, but if I really do get 6 hours in a row then it feels like a lucky day because usually it's more like 5 or less. Also, the naps are definitely here to stay. I'm about to go take one right now. Miss anything? Full lung capacity. Movement: I think the baby moves a little less often now, which is fine because supposedly it should be sleeping most of the time now. When it does move it's always big movements and a lot of times it looks a little creepy, like it's trying to climb right out the front of my body. Ha ha! Food Cravings: Dairy, carbs and salt. Anything making you queasy or sick? Chicken thighs. Symptoms: Occasional Braxton Hicks contractions, my hips are getting sore more often, I need to stop and rest a lot more often when I'm doing things like walking, even just at the grocery store. As the weather is getting warmer I've noticed my feet starting to swell a little at the end of the day. Belly button in or out? So, part of it is still in but I'm calling it. 32 weeks and it's an outie. Happy or moody most of the time: Happy but emotional. We're starting to get things ready in our house, I've started working on packing my hospital bag and then we had that tour of where I'll be delivering. All of that has been making me think about the baby actually being here and it's making me cry from feeling overwhelmed. It's not from being nervous or upset, it's just a big deal and it's feeling a lot more real finally.